Jonathan and Sheridan flew out Saturday, they are sailing with us to Panama and through the canal with a few stops en route. After a morning provisioning and lunch at the beach we readied the boat to leave. Midmorning Monday we said a fond farewell to Grenada to sail westward. It is often hard to find a moment to look up from coiling the lines, stowing the fenders and checking the charts as we leave a marina or anchorage but I always try to make sure I say a quiet goodbye to places as we sail away. For the first few hours the winds were light and directly behind us, add to that rather lumpy seas that rolled the boat and flogged the sails, it wasn’t comfortable. The 410 nm to our next destination, Bonaire, seemed like a long way away. Within a few hours however the sea settled, the wind increased and backed slightly to the north and a strong westward current appeared. For the next 48hrs that’s pretty much how it stayed. We were running a downwind rig with the genoa poled out to windward, the boom on the other side as far forward as the shrouds would allow and the stay sail pulled tight in the centre. With the favourable current we have been flying along often at over 8kts with the promise of arriving in Bonaire with an hour or two of daylight remaining. Today unfortunately the wind has dropped and is back in the east, so to keep us on schedule the engine is on. But it has been a pleasant sail, conditions have been relatively benign, with little rain, sparkling sea and moonlit nights. The watch system has worked well and with Jonathan, an experienced sailor, onboard, Rick has got much more sleep than normal. We have been entertained by shoals of flying fish and flocks of fishing birds. We saw again the elusive green flash as the sun dipped below a crisp horizon and at night we have whiled away the hours identifying the stars using a clever star guide app on my iPad. It is amazing how far the flying fish can fly, a few feet above the waves they swoop and glide, looking much like a swarm of giant dragon flies. For some reason at night they fly much higher, sometimes high enough to strand themselves on our decks, as Sheridan can attest to. During her early morning watch she was startled as one flew straight into the cockpit and hit her on the head! We are sailing less than a hundred miles from the Venezuelan mainland so we have had plenty of bird life around the boat as well. Our favourites were the masked Boobies, largish white birds with black around their faces, on their tails and under their wings. They dive spectacularly, vertically straight down, to catch small fish which they eat on the surface before taking off and diving again. 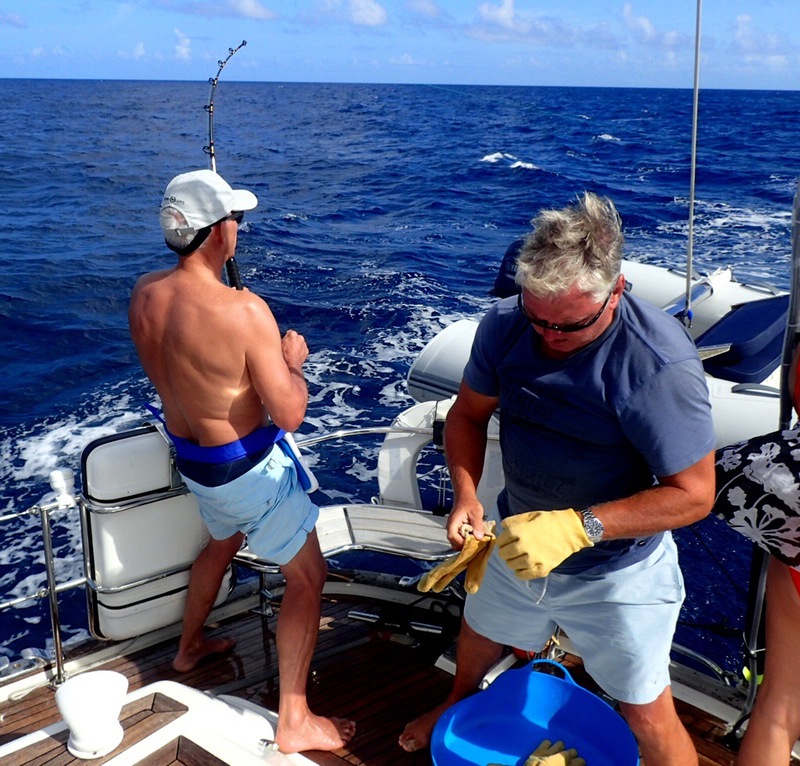 Not too much luck however with the fishing this trip, there was the ‘one that got away’, a 3ft Dorado that escaped as Rick attempted to haul him onboard and a Spanish mackerel too small to bother with, otherwise the rods have been quiet. We have noticed one odd thing, all our catches on the boat so far have been with the starboard rod, whichever lure is put on the port side nothing happens? Bonaire is the B of the ABC islands, three islands that lie north of Venezuela and are part of the Netherlands Antilles. 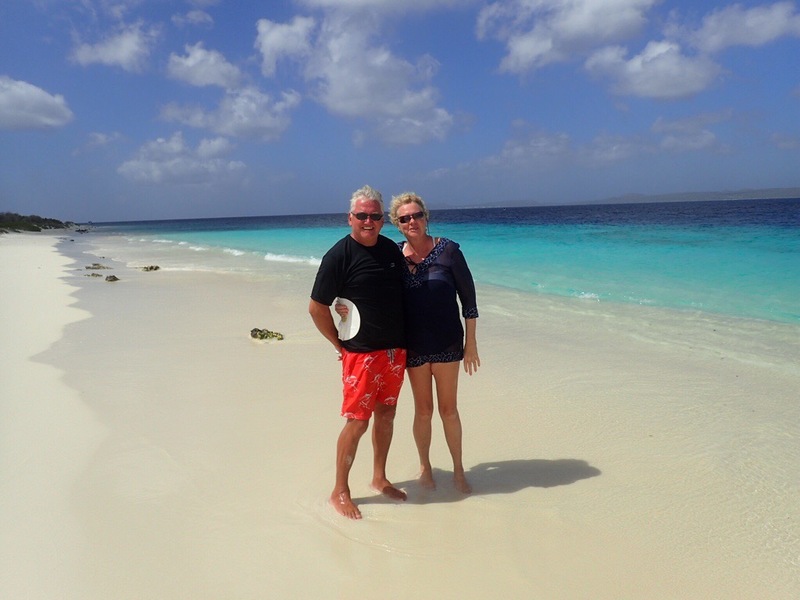 The coast off Bonaire is very deep and the water crystal clear, the National Park to the north is home to the rare yellow shouldered parrot and many of the beaches are turtle nesting sites. The authorities are making a big effort to preserve this pristine environment, imposing strict rules, there is no anchoring anywhere around the Island, large sections of beach are off limits and to dive or even snorkel you need a permit. Yachtsmen are asked to dispose of their rubbish correctly, use their black tanks at all times and be careful not to allow anything to end up overboard. A couple times a year the local population don thier scuba gear and take to the harbour to clean the sea bed. We approached around the south of the island past the salt lakes, used still, to provide salt for export. We pass three coloured obelisks along the shoreline, spaced about half a mile apart, that years ago were used to indicate the location of varying grades of salt available to the ships arriving to take salt around the world. The main island is kidney shaped with a small island lying to the west, providing a well protected natural harbour at its centre. We sail in as the sun sits low in the sky and pick up a mooring bouy off the main town. Kralendrjk is an interesting place, which we are finding as hard to describe as to pronounce. It stretches long and thin along the sea front, the buildings architecturally unremarkable but solid and colourful with their orange roofs and yellow and blue walls. The traffic moves along the streets at a snails pace and the locals, a mix of Caribbean, Dutch and American, are happy and helpful, there is a definite feeling of a place stuck, pleasantly, in the past. 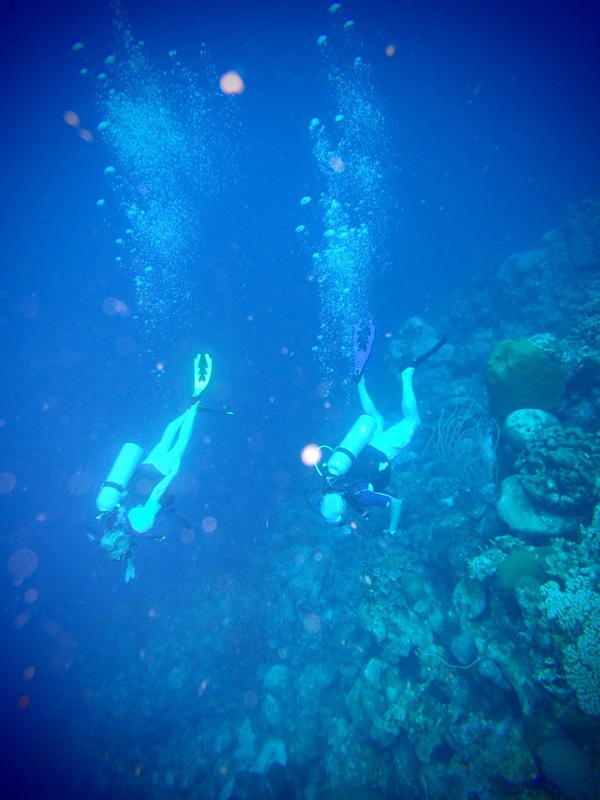 After checking in at customs and immigration and wandering around, we pop into one of the numerous dive centres to buy our snorkel permits and get the low down on the best spots to visit. The island of Kliene Bonaire, an easy dingy ride away, is one of the spots recommended, so we collected our stuff and motor across. As we approach, the white sand and turquoise sea is breathtaking and when we put our heads underwater the clarity of the water is amazing. We are surrounded by hundreds of fish, of dozens of species, large dazzling Parrot Fish, inquisitive Sargent Major’s and large silver Bermudan Chub, yellow and blue Scrawled Filefish, two foot long Trumpetfish and tiny iridescent blue Angel Fish. The corals seem to sparkle in the sunlight. 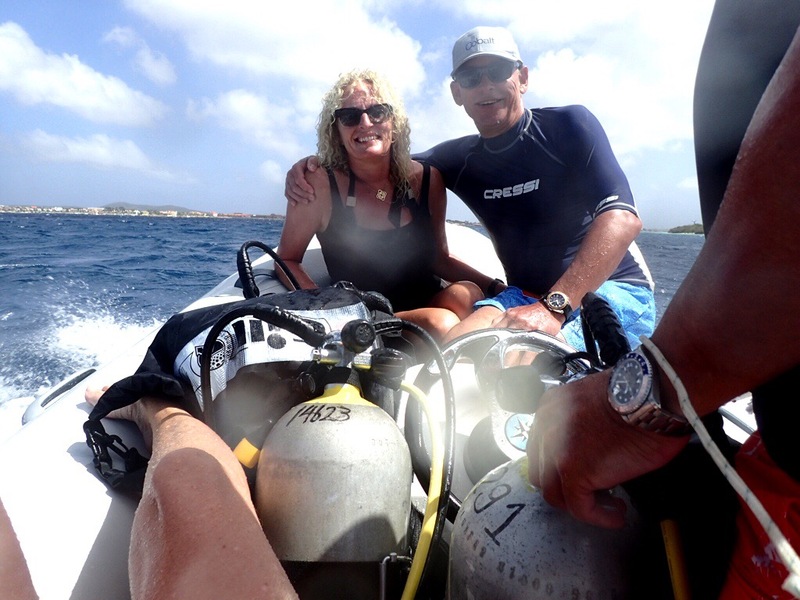 Bonaire, our guide book tells us, is one of the top three of the Worlds scuba diving areas, we were sceptical, could it really compete with the Maldives or the Red Sea, after our first rate snorkel we decide to stay another day and take a dive trip to investigate. About 30m off the beach a change in colour from turquoise to dark blue marks where the sea bed drops away to hundreds of meters deep, creating what’s termed in scuba speak as a wall. These walls are brilliant to dive as they are covered in coral and fish and importantly to us, without a guide, you can’t get lost. The coral was extremely petty, hundreds of different varieties of hard and soft corals, the branches swaying in the current. The small fish weave in and out and the larger ones patrol up and down the sides. A shoal of bright blue Chromis rush past us, we peer warily into the never ending blue to see what might be chasing them. After 40mins we come to the top feeling exhilarated, but top three, well perhaps at other spots on the island. This entry was posted in Caribbean, Passage making by Roz. Bookmark the permalink. Have just got decent internet after two weeks at sea and at anchor received this thanks Jill. Enjoy your holiday. Just brilliant. Love the blogs as ever, and the tracker is fabulous. I am officially and irredeemably jealous. It looks wonderful. And at so many levels. As to my winter? It is what it is, but the pictures of golden sand and blue sea are good to … Errr …see. And, though this is perhaps a bit unkind, the thought of being assaulted by an out of control, and presumably very surprised , flying fish does raise a smile. Sorry. Slapped in the face by a wet fish? Well she had it coming!